NEW YORK (AP) -- Weak earnings forecasts from Procter & Gamble and AT&T held the Dow Jones industrial average back on Wednesday. P&G, the world's largest consumer goods maker, fell 4.8 percent to $78.03 after the maker of Tide detergent and Gillette razors said its revenue fell short of the expectations of Wall Street analysts. The company also issued a weak profit forecast for the next quarter. AT&T dropped 5.9 percent to $36.70 after it lost phone subscribers from its contract-based plans for the first time as sales of smartphones slow. Those declines were enough to keep the 30-member Dow in the red, despite more stocks rising than falling in the index. The Dow was down 24 points by noon Eastern time. In the broader Standard & Poor's 500 index, the earnings news was mixed. Yum Brands, which owns KFC, Pizza Hut and Taco Bell, was among the gainers, advancing 7 percent to $68.70. Yum reported earnings late Tuesday that exceeded the expectations of financial analysts. General Dynamic, the aerospace and defense company, also surged after posting a profit that was better than expected. The stock jumped 5.3 percent to $70.66. Other companies, including home appliance maker Whirlpool and drug maker Eli Lilly, disappointed investors. 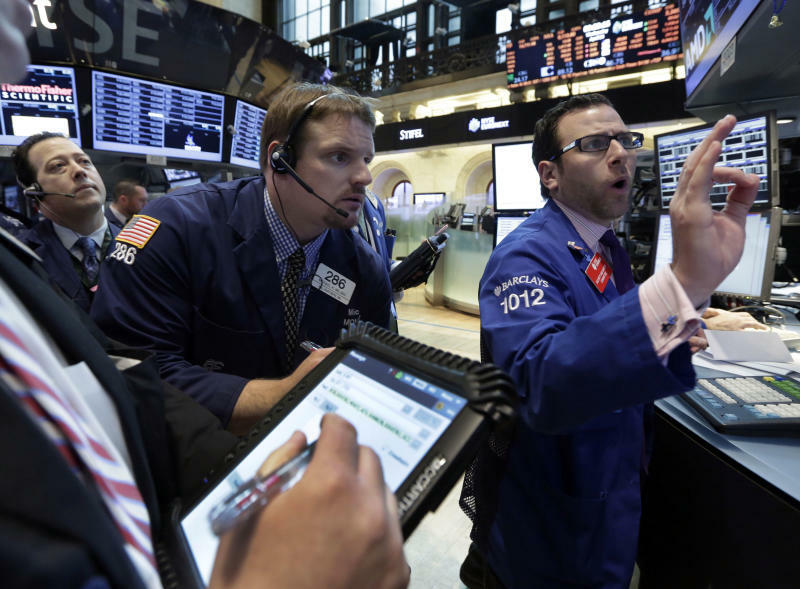 The Dow Jones industrial average was down 0.2 percent at 14,695 at midday. The S&P 500 index rose one point, or 0.1 percent, to 1,579. The Nasdaq composite was down six points, or 0.2 percent, at 3,264. While the majority of companies have been exceeding Wall Street's expectations on earnings, their performance on sales hasn't been as strong, suggesting that they are struggling to grow. About 67 percent of S&P 500 companies that have reported earnings so far have beaten expectations, better than the 10-year average of 62 percent, according to S&P Capital IQ. However, only 42 percent have beaten revenue forecasts. Company earnings so far have been consistent with signs that the global economy is slowing, said Jim Russell, a regional investment director at U.S. Bank. Russell said it's too early to conclude whether the slowdown will be short-lived. "We think that most managements are appropriately cautious in their outlooks, because it's very possible that the second-quarter will continue to slow," said Russell. "We're watching with cautious optimism that this is a second-quarter-only soft patch in the economic data." A report Wednesday that orders for long-lasting U.S. factory goods fell more than economists expected last month added to the signs that global growth is cooling. The Commerce Department said orders for durable goods declined 5.7 percent in March following a 4.3 percent gain the previous month. February's figure was also revised lower. Stocks logged their biggest weekly drop in five months last week after growth in China, the world's second-biggest economy, slowed. Weaker hiring and manufacturing growth in March have also weighed on the stock market this month. The market's gains this month have been modest after a first-quarter surge that pushed both the Dow Jones and the S&P 500 to record highs. The Dow is up just 0.8 percent in April, the S&P 500 index 0.6 percent. During the first three months of the year, the Dow and the S&P 500 averaged monthly gains of more than 3 percent, driven by optimism that the housing market was recovering and company earnings would continue to climb. Among other companies that reported earnings, Boeing rose 3.6 percent to $91.27 after the airplane maker said its first-quarter net income rose 20 percent despite problems with the 787 Dreamliner. The company said it would still meet its financial and delivery targets this year even after the 787 was grounded in mid-January because of problems with its batteries. Amgen plunged 6 percent to $105.80 after the biotech company's sales growth disappointed investors. In government bond trading, the yield on the 10-year Treasury note, which moves inversely to its price, was little changed at 1.71 percent.